The flexible Braille display for the workplace. Braille Star 80 is the optimized Braille system for every workplace, equipped with 80 piezoelectric Braille elements. It is designed for stationary use with a computer system. 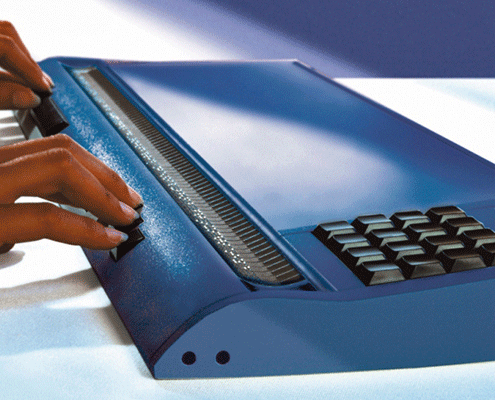 In combination with the PC keyboard, you can use the Braille Star 80 even without a computer to write notes. 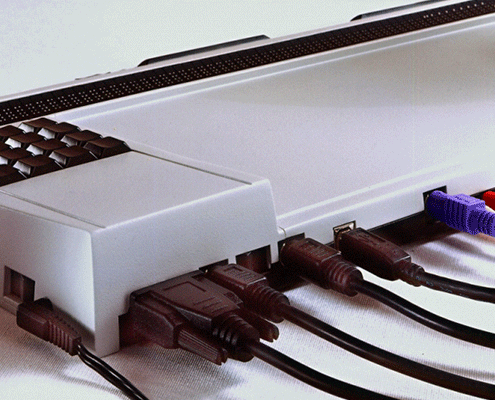 This is how the Braille Star 80 becomes an intelligent Braille system. 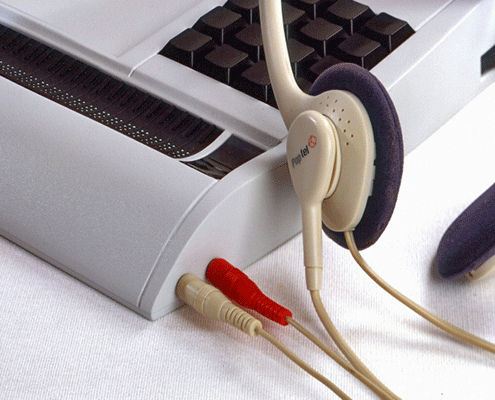 The PC keyboard can be placed directly on the Braille Star 80. 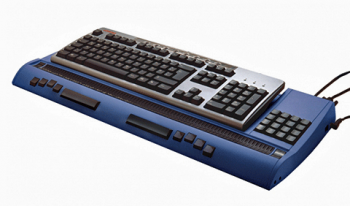 In addition to a 16-key pad, the Braille Star 80 offers 8 function keys. These are ergonomically arranged for Braille input. Braille Star 80 can be connected to a PC via USB or the serial port. 2 Audio-Stereo signals, connectable on the back of the Braille Star 80, are passed through to the right front corner of the Braille Star. This allows you to connect a headset and microphone conveniently and directly to the -Braille Star 80. Braille Star 80 can be used with different screen reading programs in order to work on various operating systems including Windows as well as Linux and DOS. With just one keyboard, you can either take some notes internally or control the PC. The keyboard is connected directly to the Braille Star 80 and can be switched over easily. The Braille Star 80 is available in blue and silver grey. Your notes will be stored as files within the Braille Star 80. Up to 5 files can be opened in parallel. Alt + Tab (chord 568) allows you to change between open files. 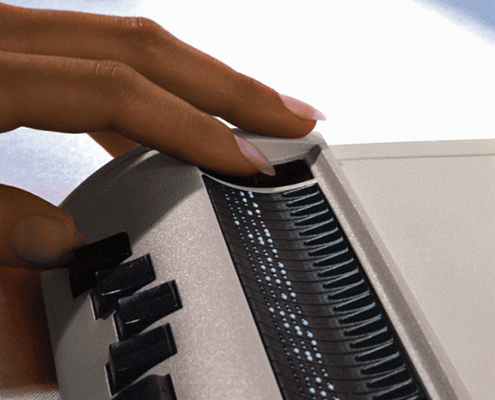 A file can be as big as 3 MB, and up to 512 files can be stored in the Braille Star 80. Block functions like Copy (Ctrl + C), Cut (Ctrl + X) and paste (Ctrl + V) are available. There are also clipboard and an easy to use search and replace function. HTCom, the supplied Communication program, allows easy transfer of data from Braille Star 80 to the PC and back again. In addition, HTCom allows you to send directly the Windows clipboard to the Braille Star. A grade-2 translator as well as a monitor mode for visualizing the display of the Braille Star 80 are also integrated in HTCom. You can also send Word documents directly out of Word or use the “Send To”-function of the Explorer to transfer files into the Braille Star 80. With the Braille Star 80, Handy Tech again sets new standards in ergonomical design. The surface of the Braille cells is concavely shaped, optimized for the reading finger. This allows reading in a relaxed hand position. The function keys that can be used as Braille keys are ergonomically positioned for Braille entry. The triple action keys which are positioned left and right of the reading surface are also concavely shaped. The cursor routing keys are integrated in the tactile surface of the Braille cell. There is no gap between the Braille display and the front of the PC keyboard. Therefore only a minimum of movement is required while moving the hand from the keyboard to the Braille cells.